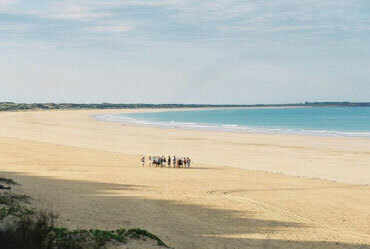 There are a number of community programs currently monitoring turtle nesting beaches throughout Australia. Cross collaboration between such programs is vital to ensure that monitoring is consistent and results contribute to the national and international knowledge of marine turtles. Following are some case studies of communities that have implemented their own turtle monitoring programs. Gnaraloo Station is situated adjacent to the Ningaloo Marine Park in the Ningaloo Coast National Heritage listed area. It has significant rookeries of endangered sea turtles, including the third most significant Loggerhead (Caretta caretta) breeding area in Western Australia. Gnaraloo commenced a turtle conservation program during 2008 to monitor and protect habitat, under the guidance and direction of the Department of Biodiversity, Conservation and Attractions (DBCA) and through engagement of scientific volunteers. The Gnaraloo Turtle Conservation Program (GTCP) is based on the Ningaloo Turtle Program in Exmouth. DBCA provides technical advice and training to the program while Gnaraloo undertakes and manages on-ground work from November to April, including track monitoring, species identification, nest counts, hatching success determination, hatchling counts and data collection on predation. The objectives of the GTCP include biodiversity protection, conservation of endangered marine species, protection of critical coastal nesting sites, community engagement, capacity building in volunteers and increasing awareness of conservation issues. Gnaraloo has also put in place a specialized fox control program to protect turtle nesting areas along its shores. See www.gnaraloo.com for reports, field diaries and photos. The Care for Hedland Environmental Association, Flatback turtle monitoring program began in October 2004 through the assistance of WWF and the Ningaloo Turtle Program. The Program is conducted from November to March each season and uses a track monitoring method that allows for the recording and marking of successful nesting attempts, as well as the recording of potential disturbance to nests such as vehicles, fox predation. The non-invasive nature of the monitoring allows for a high level of community involvement from school aged children to adults. In past seasons Port Hedland turtle program has attracted approximately 70 volunteers who have recorded approximately 1300 nests and 800 false crawls. 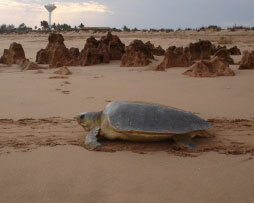 The West Pilbara Turtle Program (WPTP) has been operating along the beaches of Cape Lambert and Wickham since 2005. The program, funded by Rio Tinto and assisted by Department of Biodiversity, Conservation and Attractions (DBCA), was formally established as a partnership to support a local community program which had been active since 2003. Under the program, local community members monitor Cape Lambert and Wickham beaches during turtle nesting and hatching season (October – March). This includes two beaches within Rio Tinto’s lease area. All volunteers complete a training program, devised by the Ningaloo Turtle Program, and conduct daily monitoring of turtle nesting activity. This involves identifying the species of turtle from tracks left in the sand, determining successful nests and non-nesting emergences (false crawls), identifying feral predation and monitoring hatchling emergences. The Cape Lambert/ Wickham nesting beaches are predominantly used by flatback turtles, however green and hawksbill turtles are sometimes recorded. Between 2009 and 2012 only flatback turtles were seen, and an average of 157 nests were recorded per season. WPTP brings together industry, government and the community to monitor marine turtle nesting in the West Pilbara area and raises awareness on the importance of these beaches for marine turtle conservation. To date the partnership has indicated that informative data on turtle monitoring can be gained by community volunteers, and that considerable community spirit is generated as a result. After a desire to make more Broome locals aware of nesting marine turtles on Cable Beach, Conservation Volunteers Australia (CVA) in Broome instigated the first year of a community turtle monitoring program during the 2006/07 Flatback nesting season. After training with the Ningaloo Turtle Program in Exmouth, Kelly Howlett of Care for Hedland helped train interested volunteers in the Broome region. Volunteers were taught track monitoring techniques, data collection and correct interaction protocols for marine turtles. The monitoring beach was divided into 3 sections; Minyirr, Dabadabakun and Billingur. Daily monitoring commenced with the 30 local volunteers collecting their CVA patrol bag and walking along their designated section of coast. Leslie Baird (Chelonia Wildlife Rehabilitation & Release) was on call in case of any stranded or injured turtles. Low turtle numbers are typically recorded at Cable Beach, with an average of approximately 35 nests being recorded per season, which are usually created by flatback turtles. The Broome community remains supportive of community turtle monitoring program run by CVA which operates with the support of the local Rubibi indigenous community and the Kimberley Land Council.